Salvador Allende Gossens (1908–1973), democratically elected President of Chile in 1970, pledged to move Chile to socialism within a constitutional framework. A medical doctor by training, and a long-time member of the Socialist Party, Allende won a seat in the Chamber of Deputies in 1937 and the Senate in 1945. He campaigned for the presidency four times (1952, 1958, 1964, and 1970), always at the head of a coalition of left-wing parties. He was deeply committed to improving the condition of the country’s poor, workers, peasants, and women, insuring Chilean ownership of its natural resources, strengthening state ownership of the economy, and deepening popular democracy and worker control of industry. His program was undermined by the conservative opposition, conflicts within his own governing coalition, spontaneous revolutionary activism, and the unrelenting antagonism of the Nixon Administration. He died in a military coup on September 11, 1973, which initiated a 17-year long military dictatorship. From his earliest political activities in the 1920s until his death on September 11, 1973, Salvador Allende steadfastly maintained that Chile’s workers, peasants, and the poor deserved a better life, that they were entitled not only to economic security but to experience the “the joy of living,” and that Chile had an unquestionable right to its own resources.1 Nor did he ever waver in the certainty that these goals could be achieved in a fashion consistent with Chile’s democratic and constitutional history. His attempts to unite socialism, anti-imperialism, nationalism, and democracy in Chile while facing the concerted opposition of Washington, made him a subject of fascination and admiration around the world. His integrity, and his ultimate decision to die for his beliefs when these attempts failed, made him a martyr. Salvador Allende Castro (1871–1932), Allende’s father, studied law at the University of Chile. He was an extrovert who delighted in the company of others, whereas his wife, Laura Gossens Uribe, was quiet and serious, a devout Catholic who attended Mass daily. Allende’s parents were married in 1898 and had six children although the first two died at a young age. Instead, Chile itself proved to be Allende’s most important tutor. He finished his secondary studies in 1924, as the country entered a prolonged period of tumultuous change. Arturo Alessandri Palma had been elected president in 1920, as the head of a centrist alliance of liberal-leaning parties. Although drawn from the elite, he began a lengthy and halting process that would shift Chile towards a modern activist state, loosening the “stranglehold” long held by powerful latifundistas.12 Years later Allende eulogized the “popular caudillo,” crediting him for shaking “the frozen history of our country with vigorous ideas of a social transformation.”13 While the nature and tasks of the state would be transformed in ways he never foresaw, Alessandri’s presidency sparked a half-century of dramatic changes: a vastly expanded electorate, the emergence of powerful state agencies, the passage of transformative education and social welfare policies, increased attempts to temper U.S. corporate control of Chile’s natural resources, and enhanced support for wage earners. Figure 1. Salvador Allende, Regimiento Lancers de Tacna, 1925. Allende began a six-year course of studies at the University of Chile in March 1926, a tumultuous time in Chilean politics. Alessandri, who had stepped down under pressure in 1924, returned to the presidency shortly thereafter, only to be forced out again in 1925, moves that were largely orchestrated by Lieutenant Colonel Carlos Ibañéz. Ibañéz would maneuver himself into the presidency in 1927, quickly turning against his socialist-inspired allies, including the student movement, suspending Congress and ruling by decree. Allende was never far from these events. He moved from his aunt’s house to Recoleta, a “very humble district” in Santiago, taking classes during the day and reading “Das Kapital, and Lenin, and . . . Trotsky” at night.16 His medical training informed his life-long commitment to improving the health of the poor, and his dedication to socialism grew out of the practical experiences that unfolded in the clinics serving impoverished neighborhoods in Santiago. University-level student politics were often training grounds for later political careers, and Allende entered this arena in 1927, as president of the notably activist association of medical students. Three years later, he helped revive the Student Federation of the University of Chile (FECH), shut down by Ibañéz in 1926. Allende’s participation in “Avance,” a student group largely composed of socialists and communists that attempted to push the FECH to the left, proved formative. His schoolmates from that time recalled the young Allende’s ability to capture the attention of a rowdy student gathering through his oratorical prowess.17 These early experiences, which he perfected over a long career in Congress and on the campaign trail, likely led him to believe that he could bring opponents to his viewpoint through the power of his speech alone. His opposition activities also led to his suspension from the university and a brief jailing. Readmitted in 1932, Allende received his degree, with high honors, following the completion of his thesis in 1933.20 He returned to Valparaíso to be with his father, who was dying of diabetes, but his search for work proved difficult; he often claimed that his activist reputation preceded him. The only employment he could find was as a pathologist’s assistant, “ripping open cadavers,” as he put it. An eclectic mixture of expelled or disaffected members of the Communist Party (PC), social democrats, anarcho-syndicalists, anti-imperialists, Trotskyists, and independents launched the Socialist Party (Partido Socialista, PS) in April 1933. Contrary to the older PC, with which it was often at odds, the party never imposed doctrinal orthodoxy. The PS abandoned, at least until its 1967 congress in Chillán, Lenin’s call for a dictatorship of the proletariat and turned away from Moscow’s control.25 It was committed to state ownership of the means of production, advancing working class and peasant interests, and anti-imperialism. The Socialist Party became Allende’s political home, and he became the only person who could quiet, if not tame, its fractious components. Figure 2. Allende in the uniform of the Socialist Party, c.1937. An earthquake in Chillán, in 1939, would unexpectedly shape Allende’s future. He was attending a meeting at his Masonic lodge in Santiago while Hortencia Bussi, “Tencha” as everyone knew her, was at a nearby cinema when the city began to shake. Both rushed into the street and, through mutual friends, were introduced. Tencha had taken her teaching degree, in history and geography, from the University of Chile’s Pedagogical Institute and would later study statistics and work as a librarian. They were married in September 1940, a union marked by a shared political perspective, deep mutual regard, and Tencha’s strong support for her husband’s political career, even though it was widely known that he maintained significant romantic relations with other women. Tencha would go into exile in Mexico following Allende’s death in the 1973 coup, returning in 1988, as the dictatorship came to an end. She headed the Salvador Allende Foundation until her death in 2009. Figure 3. Hortensia Bussi de Allende and Salvador Allende, 1946. Archivo General Histórico del Ministerio de Relaciones Exteriores. Of the couple’s three daughters, Carmen Paz, Beatriz, and Isabel, the latter two followed in their father’s footsteps. Beatriz studied surgery and became a doctor; she also became one of her father’s closest political confidants. Farther to the left than Allende, Beatriz acted as a trusted contact between her father and the Movement of the Revolutionary Left (MIR). She remained at his side in the Moneda on the day of the coup until he forced her to abandon the besieged presidential palace. She fled to exile in Cuba with her husband, a Cuban diplomat, where she directed the Cuban-based Chilean Anti-Imperialist Solidarity Committee. She committed suicide in Havana in 1977. Isabel also followed her father’s path into socialist politics after studying sociology at the University of Chile. 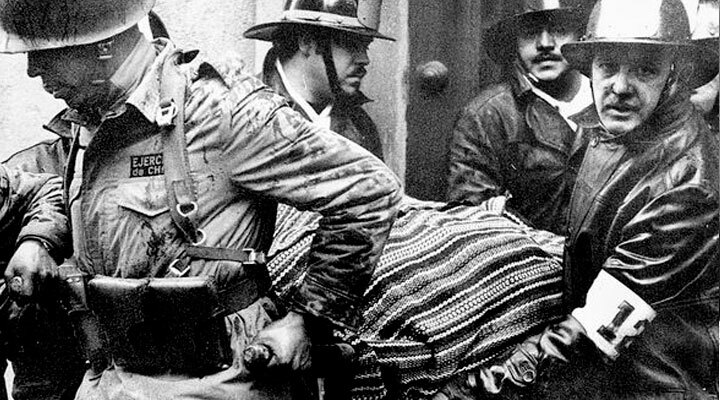 Like her sister Beatriz, she rushed to the Moneda on September 11, 1973, as the coup unfolded, and left the building only when ordered to do so by Allende. She followed her mother into exile in Mexico, returning to Chile in 1989. She was elected, as a Socialist, to the Chamber of Deputies in 1994, became a senator in 2010, and, in March 2014, was elected the first female president of the Senate. Allende won his own seat in the Senate in 1945, and would remain a senator until 1970. He continued to advocate for his passionately held issues: worker and peasant rights, the strengthening of social welfare programs, and the nationalization of U.S.-owned copper companies. As chairman of the Senate’s Health Committee, he wrote legislation that consolidated many of Chile’s health care programs in the National Health Service. He was elected the Senate’s vice president in 1954, its president in 1966. He remained unswerving in his defense of the Marxist left, including, despite strong ideological differences, the Communist Party (PC). In 1948, he blasted President González Videla for banning the Communists, under pressure from the Truman Administration, despite the fact that Videla had courted their support for his own election. Allende described the President’s act as a “veritable atomic bomb launched against a social order built over long years of effective democratic tradition.”28 He demanded that Chile live up to its promises by “respect[ing] . . . the guarantees which our Constitution establishes,”29 and he assailed the hypocrisy of legislators who, in the name of democracy, eliminated fairly won political representation from those with whom they disagreed. As a Marxist, he argued, he was a revolutionary, but a true revolutionary was not one who seized power, but rather the individual who, on “reaching power legally,” instituted “profound and creative transformation . . .”30 Nevertheless, the Communist Party was proscribed for the next decade, and many of its leaders sent into exile and stripped of their political rights. Figure 4. Allende’s 1958 Victory Train. Biblioteca del Congreso Nacional, Chile. The FRAP chose Allende once more in 1964. By then the contours of Chilean politics had shifted significantly. The Cuban Revolution, in particular, transformed Latin America’s political landscape. Allende visited Cuba in 1959, shortly after the insurgents took power, meeting with the Cuban leadership and praising a people “spiritually and materially mobilized and fully interpreted by their government.”33 In both 1964 and 1970, conservatives bludgeoned him for his steadfast support of the revolution, seeking to stir fears among voters that Allende’s Chile would become a communist gulag replete with firing squads, Soviet tanks, and children ripped from their parents’ arms to be raised in communist re-education camps. With characteristic humor, Allende once responded by winking at the widespread, and likely accurate, accounts of his womanizing: “They say that I want to take children from their mothers,” he intoned. “Those who know me know that is a villainous slur. Perhaps I want to take the mothers away from their children; that could be.”34 But Allende would never abandon his determination to bring Chile to socialism by its own constitutional path, in accordance with what he saw as Chile’s specific history, even as he never abandoned his support for Cuba’s revolution or the attempts by armed revolutionaries in other countries, from Bolivia to Vietnam, to promote needed changes. His assistance would prove crucial in ferrying the survivors of Che Guevara’s ill-fated 1967 campaign in Bolivia to safety. Figure 5. Eduardo Frei Montalva (left) with Salvador Allende (right), and Hernán Santa Cruz Barcelo (center), c. 1960. As was common with many political elites in Chile, Frei and Allende had been friendly prior to the 1964 election. While their families often socialized at Allende’s beach house near Valparaíso, Allende saw the 1964 election as a “dirty victory,” because of the PDC leader’s reliance on the CIA and his blatantly false scare campaign; it ruptured the friendship the two had shared.38 Frei would prove instrumental in turning the PDC against any understandings with Allende when the latter became president. Frei promised a “Revolution in Liberty,” but Allende predicted its failure given his dependence on conservative business sectors and Washington’s support. Frei initiated a modest, but important, agrarian reform process and moved to “Chileanize” the copper industry by purchasing 51 percent of the shares of U.S. mines. But the demand for deeper reforms divided his party, and a worsening economic situation led to an upsurge in street protests and land takeovers. And yet, as midnight approached on the night of September 4, 1970, the Interior Minister informed Allende that his 36.6 percent put him in first; he slipped past Alessandri by 39,000 votes out of nearly 3 million cast. Because he lacked an outright majority, the vote would have to be ratified by Congress, but it appeared that Allende’s nearly two-decade long quest for the presidency had finally succeeded. His victory speech was as much pre-emption as promise. As no candidate won a majority of the votes, the election would go to Congress where, by custom, legislators chose the candidate who came in first in the popular voting. Knowing this and expecting he would win a close election, Jorge Alessandri pledged two months earlier to refuse the presidency if he didn’t finish first in the popular vote. Yet on September 6, his aide called on the Christian Democrats to support Alessandri in the congressional voting, thereby “saving” Chile from Marxism.44 The PDC refused, but made its support for Allende conditional on his signing a Statute of Constitutional Guarantees. A smooth transition was further undermined by the Nixon Administration’s determination to block Allende. As part of a broader scheme, the CIA supplied a group of right-wing plotters with arms and funding to kidnap the constitutionalist Commander-in-Chief of the Army, General René Schneider, an outrage to be blamed on the Left and designed to prod the military into action against Allende.45 The plot failed, Schneider was killed, and on October 24, Congress elected the UP’s candidate. But intransigent opposition to Allende from Washington, the National Party, and an emerging paramilitary right, together with Christian Democratic distrust, suggested how demanding would be his task ahead. Figure 6. Salvador Allende receives the presidential sash, Oct. 24, 1970. Biblioteca del Congreso Nacional, Chile. A clear-headed realist, Allende understood the challenges he faced. “I believe,” he told Regis Debray in a January 1971 interview, “that the Head of State who is a socialist remains a socialist, but his actions must be consistent with reality.” Chile, he added, would “draw upon its own experience” to move forward while respecting the “limitations imposed by a system which is not of our making.” His goals had remained remarkably consistent over almost four decades. He would “favor a centralized economy,” maintain “continuous dialogue with the workers,” put into effect a “far-reaching Land Reform,” “collectivize a major portion of . . . national production,” nationalize copper, and “establish new social relations in the country.”46 The Debray interview came at a moment when Allende had reason to believe that he could manage the conditions under which a “democratic, national, revolutionary and popular Government [would] open the road to socialism . . .” But he understood that to succeed, he needed time, broad participation and internal discipline among his supporters. Allende’s goals would prove hard to reconcile: he attempted to balance system stability while promoting revolutionary change; to unleash grassroots activism, but channel it within the constraints of government policy; to deepen democracy, while linking municipal governments to centralized planning. Yet, for a short time, he seemed to be succeeding. Expenditures on social services almost doubled from the 1965–1969 average, while the workers’ share of national income grew from 52.8 percent in 1970 to 61.7 percent in 1971.50 Industrial production increased and unemployment fell. By mid-1972, the UP had expropriated almost nine million hectares of land for redistribution to peasant families. And, as hoped, his support grew. In April 1971 municipal elections, the first following Allende’s victory, the combined UP parties gained just shy of a majority, a substantial increase from one year before. But the moment proved to be the President’s high point. On December 1, 1971, a “March of the Pots and Pans” organized by opposition women, brought thousands of women into downtown Santiago and signaled the emergence of the well-designed, mass-based opposition movement that the UP’s foes had lacked previously.51 The march protested shortages of foodstuffs and a distribution system that generated long lines of shoppers waiting to buy basic products at controlled prices. The shortages themselves were a product of conservative obstruction, as store owners took items off the shelves and sold them on the black market; the opposition media created panic-buying by reporting on shortages that did not (yet) exist, and Washington instituted an “invisible blockade” by denying credit to the UP government. But government inefficiencies, lack of experience, an inability to manage distribution, and a strategic failure to analyze women as potent political actors and to develop a political approach that could attend to their needs, all added to the problem. As the economy worsened, Allende’s political model came under increasing political fire from the Left as well as the Right. Workers in industries not slated for the Social Area forced Allende’s hand by occupying their factories and demanding expropriation.52 The leadership of Allende’s own party increased pressure on him from the Left by selecting Carlos Altamirano, the leader of the Socialist’s radical wing, as party chief in 1971. Allende had hoped for time and discipline; he found neither. After 40 years in the rough and tumble of Chilean politics, Allende knew full well the challenges he would face if elected, and yet he continued to promise a revolution of empanadas y tinto (meat pies and red wine). His election unleashed a revolutionary upsurge and a counter-revolutionary offensive, both of which quickly overwhelmed even his remarkable personal and political capabilities. As one supporter summarized, “We were on a ship of fools; we sought the impossible, but we are better for having challenged history itself.”53 Since there is no reason to believe that Allende sought the martyrdom that eventually found him, nor that he was naïve, the question one must ask is not why his experiment failed, but how he imagined it would succeed. Five central points of his strategic thinking are explored in the next section. Although the UP controlled only one branch of Chile’s government, Allende felt he had sufficient authority under the country’s 1925 Constitution to act without congressional approval if that proved unattainable. The opposition parties held approximately 60 percent of congressional seats prior to the March 1973 congressional elections, enough to thwart Allende’s legislative agenda and remove his cabinet officers, but not the two thirds needed to impeach him. The UP controlled the executive branch of a divided presidential system, but his opponents intended to block him as in a parliamentary regime, as if Allende were a prime minister who would resign if his party could no longer legislate.54 In fact, the Chilean political system has alternated between strong presidencies and domineering congresses since 1833. The opposition drew its lessons from the powerful legislatures of 1891–1923, Allende from the strong presidents prior to 1891, or those like Arturo Alessandri and Pedro Aguirre Cerda, who built Chile’s social welfare state and expanded state control of the economy. When Congress tried to block Allende’s expansion of the state sector, he turned to executive authority and the decree laws of his predecessors. And, when two Christian Democratic senators introduced a constitutional amendment in October 1971, designed to rewind his actions, they set in motion a process that ultimately brought down not only Allende’s presidency, but the congressional system itself. Congress remained shuttered between 1973 and 1990. Allende’s search for an understanding with the PDC proved equally troubled. This objective, as the last, was informed by Chile’s history. He both witnessed and helped create the center-left alliances of the 1930s that built a strong state. His presidential campaigns were grounded in alliances, and he consistently advocated building support for his programs among social democrats and moderate centrists, often including Christian Democrats. He tried to bring them into the FRAP in 1958, but was rebuffed by the Socialists. With the country fragmented politically into three thirds, in 1970, he was convinced that reaching a working relationship with centrist Christian Democrats was an important option that could allow his program to work, gaining the time he needed to build popular support. The notion of winning PDC support or preventing it from allying with the far-right National Party was not fanciful. Tomic’s 1970 campaign mirrored the UP’s in many areas. Even before his inauguration, Allende sought advice on how to nudge the Christian Democrats towards the UP and recommended such an approach to the coalition’s leadership, arguing that if he were to reach an understanding with the Christian Democrats, he could only do so while that party was led by moderates. The UP rejected his plan in late November 1970, and Tomic soon lost control of the PDC.57 Former president Eduardo Frei, by then obdurately opposed to Allende, blocked any potential agreement with the UP and soon allied his party to the right-wing Nationals.58 Frei’s control of his party tightened further when a group of left-leaning Christian Democrats (the Left Christians, IC), acting against Allende’s express wishes, broke away and joined the UP. Allende’s attempt to broker a deal lending UP support to a Christian Democratic candidate in a June 1971 by-election also failed. He would continue to look for openings to the PDC until the very end, but they never came. Allende realized his constitutionalist approach would face serious challenges from the more revolutionary left—the MIR and his party’s own left wing, led by Carlos Altamirano, and including most of its youth sectors—but he thought he could manage them personally, relying on past experiences of dealing with radical critics, which dated as far back as his days in “Avance.” His relationship with the MIR was particularly fraught and illustrated the significant generational differences that separated “old” and “new” left in Chile.59 Allende was accustomed to an older political style that stressed past collaborations and personal contacts above theoretical debate. In 1967, he had risked his political future by guaranteeing safe passage through Chile to the surviving members of Che Guevara’s guerrilla column in Bolivia. As president, he had amnestied MIRistas accused of armed actions in 1969 and 1970. He tried to take advantage of his many personal connections to the movement. His nephew, Andrés Pascal Allende, was a MIR leader; his daughter, Beatriz, provided a direct contact with the MIR as did Miria Contreras (“La Payita”), his private secretary and political confidant, with whom he had been romantically involved since the 1960s. The organization provided his bodyguards, and Allende even offered Miguel Enríquez, its leader, a position in his administration. Allende believed he could rally enough support from the international community, particularly in the Socialist Bloc, to weather Washington’s storm. And he was heartened by the standing ovation he received after addressing the United Nations in December 1972. From New York, he traveled to Algeria, and then to Moscow, where he sought but did not receive aid for an economy desperately in need of foreign exchange. Both the German Democratic Republic and the Soviet Union were sympathetic but either unwilling or unable to help. Moscow had doubts that Allende’s project could succeed and was overcommitted to Cuba.64 Fidel Castro gave Allende a hero’s greeting on his way home, but Cuba’s pledge of forty tons of sugar could not resolve Chile’s foreign exchange deficit. Allende brought the military into his cabinet as a means of resolving the October 1972 crisis caused by an employers’ lockout, and officers remained in the government until March 1973. Many criticized this step for politicizing the troops, although a future commander-in chief of the Army, who was a lieutenant at the time, later remarked that the officer corps saw it as “a necessary and viable solution to the enormous crisis we were living through.”68 But Allende’s solicitous attitude to the military also led him to ignore conspiracies, tolerate officers who broke discipline, and underestimate the extent to which Washington had penetrated the officer corps.69 His conviction that the troops would remain loyal persisted until the bitter end. Events following the March 1973 elections, in which the UP gained congressional seats in both chambers, quickly spiraled downward. On June 17, the National Party declared that Allende was “no longer . . . the Constitutional President of Chile.”70 On June 29, Col. Roberto Souper launched the tanks of the Second Armored Regiment against the Moneda, but the attempt, as much a rehearsal as an actual coup, was quickly suppressed. That evening the streets around the Moneda filled with tens of thousands of UP supporters, but Allende had effectively lost control of events. Workers in Santiago seized more than 350 factories; others, from the Teniente copper mine, walked out in opposition to the government. The military began to search for arms within leftist shantytowns and worker-controlled factories and to search out government supporters in their own ranks. On August 22, Congress accused Allende of unconstitutional acts and called on the military to “put an end to all situations . . . which infringe the Constitution and the laws.”71 Allende, holding fast to the presidential system, retorted that Congress needed a two-third vote to impeach him, not “a simple agreement.”72 On August 24, General Prats, the Army’s constitutionalist commander-in-chief, resigned, succumbing in the end to a demonstration of military wives in front of his house that had been organized by the same groups of opposition women who first began the “March of Pots and Pans” in late 1971. Allende replaced him with the next in rank, General Augusto Pinochet. The CIA had been gathering reports of Pinochet’s opposition to Allende as early as 1971, but there was no public indication that he was anything but loyal.73 Allende only learned he was part of the conspiracy on the morning of September 11. As two air force jets launched their attack on the Moneda, Allende and others fired from the windows. When further resistance seemed impossible, Allende ordered everyone to evacuate, having sent his daughters away earlier. Instead of following the others, Allende slipped back to the second floor, placed a rifle to his head and took his own life.77 He had, as Debray contemplated more than two years earlier, offered “his throat to the long knives of the enemy.”78 His body was removed by firefighters some hours later, and the military saw to his secret burial in Viña del Mar, where his body remained until the end of the dictatorship. On September 4, 1990, his remains were transferred to the General Cemetery in Santiago. Tens of thousands lined the route. Figure 7. Statue of Salvador Allende near the Moneda. Courtesy of Steven S. Volk. The study of Salvador Allende has generated a significant historiography. This can be divided into biographical literature, works about his political project, and materials examining relations between the United States and Chile. The essential archival sources for Salvador Allende are maintained at the Archivo Nacional de Chile (National Archive of Chile), located within the National Library (Santiago, Chile). The National Archive is divided into two sets of main holdings, the Archivo Nacional de la Administración (National Administration Archive) and the Archivo Nacional Histórico (ANH, National Historical Archive), both of which maintain collections on Allende. The former, with documentation from all ministries, contains archives of Allende’s service as Minister of Health under the government of Pedro Aguirre Cerda, as well as the ministerial archives of the Popular Unity period. The ANH has a small collection on Allende (five boxes, 0.65 linear meters) as well as a larger collection (fifteen boxes, 6.22 linear meters) on Orlando Letelier Solar, who served as Allende’s ambassador in Washington as well as minister of Foreign Affairs, Defense, and Interior. The ANH archive is searchable on line. The National Archive maintains an archive of photographs of Chilean presidents, with an on-line and searchable catalog. The National Library also maintains the most complete collection of Chilean newspapers and magazines. The Fundación Salvador Allende (Salvador Allende Foundation) maintains a large collection of archival materials on Allende’s life and work, including documentation and audio, photographic, and moving image collections, along with a library devoted to Allende’s work. Understanding Allende’s relations with Washington is central to our understanding of Allende’s presidency. After years of pressure and a number of lawsuits, various branches of the U.S. Government began releasing large sets of formerly classified documents in 1999. In all, the Chile Declassification Project produced 24,000 records, including 18,000 from the Department of State and lesser amounts from the White House, National Security Council, Pentagon, and FBI. The documentation covers the period between 1970 and 1990. The National Security Archive (NSA), a private, non-profit organization housed at George Washington University, was largely responsible for securing the declassification of the government’s holdings on Chile. The Chile Documentation Project of the NSA is housed at George Washington University and maintains an online archive. Documentation is updated regularly as new sources become available. The National Archives and Records Administration in College Park, Maryland also houses valuable materials for this period from the Central Intelligence Agency and the Department of State as well as the Nixon Presidential Materials Project. (1.) Salvador Allende, “Romper los moldes de la economía liberal. Discurso de homenaje al triunfo del Frente Popular, 25 de octubre de 1943,” in Frida Modak, ed. Salvador Allende en el umbral del siglo XXI (Mexico, DF: Plaza & Janés Editores, 1998), 32. (2.) Virginia Vidal, “Los abuelos de Allende: Héroes de la independencia, políticos y artistas,” Anaquel Austral, September 4, 2012; and Eduardo Labarca, “La senadora Allende se equivoca sobre el nacimiento de su padre,” El Mostrador, March 18, 2014. (4.) In his interview with Regis Debray, Allende said, “I’m a native of this town, and I’m the first president from Valparaiso.” Debray, The Chilean Revolution, 67. (5.) Debray, The Chilean Revolution, 65. (6.) Debray, The Chilean Revolution, 66. (7.) Sergio Grez Toso, Los anarquistas y el movimiento obrero: La alborada de “la Idea” en Chile, 1893–1915 (Santiago, Chile: LOM, 2007); and Amorós, Allende: La biografía, 33. (8.) Debray, The Chilean Revolution, 66. (9.) Luís Corvalán, “Salvador Allende, Presidente del pueblo,” in Salvador Allende: Presencia en la ausencia, ed. Miguel Lawner, Hernán Soto, and Jacobo Schatan (Santiago, Chile: LOM, 2008), 38. (10.) Jorge Arrate, “Allende: Toda una vida, toda una muerte,” in Salvador Allende, ed. Lawner, Soto, and Schatan, 27–28. (11.) Debray, The Chilean Revolution, 69. (12.) Simon Collier and William F. Sater, A History of Chile, 1808–1994 (New York: Cambridge University Press, 1996), 204. (13.) Salvador Allende, “Arturo Alessandri Palma. Fallecimiento. Homenaje póstumo,” in Salvador Allende, Senador 1945-1951 (Santiago, Chile: Archivo Parlamentario Salvador Allende, Biblioteca Clodomiro Almeyda, Partido Socialista de Chile, 2014). (14.) Clark, Salvador Allende: Revolutionary Democrat, 18. (15.) Diana Veneros, Allende: Un ensayo psicobiográfico (Santiago, Chile: Señales, 2003), 44. (16.) Debray, The Chilean Revolution, p. 64. (17.) Óscar Waiss, Chile vivo. Memorias de un socialista, 1928–1970 (Madrid: Centro de Estudios Salvador Allende, 1986), 21–22. (18.) Fernando Silva V, Un contrapunto de medio siglo: Democracía liberal y estatismo burocrático 1924–1970, in Historia de Chile, ed. Sergio Villalobos R., Osvaldo Silva G., Fernando Silva V., and Patricio Estelle M., (Santiago, Chile: Editorial Universitaria, 1974), 827. (19.) Alejandro Witker, Salvador Allende, 1908–1973. Prócer de la liberación nacional (México: National Autonomous Univdersity of Mexico, 1980), 4–5. (20.) Amorós, Allende: La biografía, 44. (21.) Debray, The Chilean Revolution, 63. (22.) Joan E. Garcés, “Allende de Chile,” in Salvador Allende, ed. Lawner, Soto, and Schatan, 63–64. (23.) Carlos Jorquera, El Chicho Allende (Santiago, Chile: Ediciones BAT, 1990), 96. (24.) Collier and Sater, A History of Chile, 221–226. (25.) Paul W. Drake, Socialism and Populism in Chile, 1932–52 (Urbana: University of Illinois Press, 1978); Julio Faúndez, Marxism and Democracy in Chile: From 1932 to the Fall of Allende (New Haven, CT: Yale University Press, 1988). (26.) Salvador Allende, La realidad médico social de Chile (Santiago, Chile: TADESH, 1999); and Karin Alejandra Rosemblatt, Gendered Compromises. Political Cultures & the State in Chile, 1920–1950 (Chapel Hill: University of North Carolina Press, 2000), 159–160. (27.) Mauricio Amar Díaz, “Salud, educación, vivienda y trabajo en el pensamiento de Salvador Allende Gossens,” in Salvador Allende. Vida política y parlamentaria, 1908–1973, ed. David Vásquez, 173–201 (Santiago, Chile: Ediciones Biblioteca del Congreso Nacional de Chile, 2008); Max Nolff, Salvador Allende: El político: El estadista (Santiago, Chile: Ediciones Documentas, 1993), 32; and Rosemblatt, Gendered Compromises, 161. (28.) Allende, “Defensa permanente de la democracía,” in Salvador Allende, Senador 1945-1951, 408. (29.) Allende, “Defensa permanente, 413. (31.) Corvalán, “Salvador Allende,” 48–49. (32.) Osvaldo Puccio, Un cuarto de siglo con Allende. Recuerdos de su secretario privado, Osvaldo Puccio (Santiago, Chile: Editorial Emisión, 1985), 72. (33.) Amorós, Allende: La biografía, 69. (34.) Amorós, Allende: La biografía, 202. (35.) Jorquera, El Chicho Allende, 267. (36.) Margaret Power, Right-Wing Women in Chile: Feminine Power and the Struggle Against Allende, 1964–1973 (University Park: Pennsylvania State University Press, 2002), 81. (37.) Peter Kornbluh, The Pinochet File. A Declassified Dossier on Atrocity and Accountability (New York: New Press, 2003), 4. (38.) Clark, Salvador Allende: Revolutionary Democrat, 77. (39.) Eduardo Labarca, Chile al rojo. Reportaje a una revolución que nace (Santiago, Chile: UTE, 1971), 225–226. (40.) Clark, Salvador Allende: Revolutionary Democrat, 85. (41.) Nathaniel Davis, The Last Two Years of Salvador Allende (Ithaca, NY: Cornell University Press, 1985), 5; and Kornbluh, The Pinochet File, 5–6. (42.) Power, Right-Wing Women, 62–68, 270–271. (43.) Salvador Allende, “Victory Speech to the People of Santiago,” in Salvador Allende Reader, ed. James D. Cockcroft, trans. Moisés Espinoza and Nancy Nuñes (New York: Ocean Press, 2000), 48. (44.) Amorós, Allende: La biografía, 284–285. (45.) U.S. Senate, Staff Report of the Select Committee to Study Government Operations with Respect to Intelligence Activities, Covert Action in Chile, 1970–73 (Washington, DC: Government Printing Office, 1975). (46.) Debray, The Chilean Revolution, 61, 85–117. (47.) Mark Falcoff, Modern Chile, 1970–1989: A Critical History (New Brunswick, NJ: Transaction Publishers, 1989), 54–55. (48.) Alberto Martínez E., “Economía y correlación de fuerzas sociales en la transición: El caso de Chile en el período 1970–73,” in Salvador Allende, ed. Lawner, Soto, and Schatan, 111–113. (49.) Eden Medina, Cybernetic Revolutionaries: Technology and Politics in Allende’s Chile (Boston: MIT Press, 2011), 12. (50.) International Monetary Fund, Chile: Recent Economic Development (Washington, DC: IMF, 1976), Statistical Appendix, Chart C. (51.) Power, Right-Wing Women, 141–192. (52.) Peter Winn, Weavers of Revolution: The Yarur Workers and Chile’s Road to Socialism (New York: Oxford University Press, 1986). (53.) “Interview with Enrique Malbrán,” Memoria Obstinada, DVD, directed by Patricio Guzmán (1997; New York: Icarus Films, 2009). (54.) Joan E. Garcés, El estado y los problemas tácticos en el gobierno de Allende (Madrid: Siglo Veintiuno Editores, 1974), 32. (55.) Garcés, El estado, 34. (56.) Joan Garcés, Allende y la experiencia chilena (Barcelona: Ariel, 1976), 365–369. (57.) Clark, Salvador Allende: Revolutionary Democrat, 101–102. (58.) Amorós, Allende: La biografía, 375. (59.) Tomás Moulian, Conversación interrumpida con Allende (Santiago, Chile: LOM/Universidad Arcis, 1998), 35, and Marian Schlotterbeck, “Everyday Revolutions: Grassroots Movements, the Revolutionary Left (MIR), and the Making of Socialism in Concepción, Chile, 1964–1973” (doctoral dissertation, Yale University, 2013). (60.) Julio Silva Solar, “¿Era viable el proyecto de la Unidad Popular”? in Salvador Allende, ed. Lawner, Soto, and Schatan, 101. (61.) Peter Winn, “The Furies of the Andes. Violence and Terror in the Chilean Revolution and Counterrevolution,” in Greg Grandin and Gilbert M. Joseph, eds., A Century of Revolution. Insurgent and Counterinsurgent Violence During Latin America’s Long Cold War (Durham: Duke University Press, 2010), 246. (62.) Tanya Harmer, Allende’s Chile & the Inter-American Cold War (Chapel Hill: University of North Carolina Press, 2011), 121–123. (63.) Among others, Kornbluh, The Pinochet File; Harmer, Allende’s Chile; and U.S. Senate, Staff Report of the Select Committee, Covert Action in Chile, 1963–1973. (64.) Harmer, Allende’s Chile & the Inter-American Cold War, 198. (65.) Ozren Agnic, Allende: El hombre y el politico: Memorias de un secretario privado (Santiago, Chile: RIL Editors, 2008), 59–62; and Miguel Labarca, Allende en persona: Testimonio de una intensa amistad y colaboración (Santiago, Chile: Ediciones Chile America, 2008), 67, as cited in Clark, Salvador Allende: Revolutionary Democrat, 64. (66.) Amorós, Allende: La biografía, 252. (67.) Lavretski, Salvador Allende, 110. (68.) Hernán Soto, “El gobierno de Allende y las Fuerzas Armadas,” in Salvador Allende, ed. Lawner, Soto and Schatan, 141–145. (69.) Soto, “El gobierno de Allende y las Fuerzas Armadas,” in Salvador Allende, 145. (70.) Miguel González Pino and Arturo Fontaine Talavera, eds., Los mil días de Allende (Santiago, Chile: Centro de Estudios Públicos, 1997), 1: 689. (71.) El Mercurio (Santiago, Chile), August 23, 1973. (72.) Salvador Allende, “Al pueblo de Chile,” in Salvador Allende en el umbral del siglo XXI, 95. (73.) Kornbluh, The Pinochet File, 95–96. (74.) Miria Contreras (“La Payita”) provided a detailed account of the final days before the coup in a letter she sent to Beatriz Allende a few weeks after the coup. It was published in The Clinic (Santiago, Chile), September 4, 2003. (75.) New York Times, January 26, 1974. The photographer, Luís Orlando Lagos Vásquez, remained anonymous until his death in 2007. (76.) All citations from Salvador Allende, “Ultimo Discurso (Discurso: Texto Completo),” September 11, 1973. Author’s translations. (77.) The account of Allende’s suicide, doubted for years, was confirmed by Dr. Patricio Guijón, his doctor and a close friend, who witnessed it. Two autopsies, the last performed in 2011, confirmed the account. “Chilean President Salvador Allende committed suicide, autopsy confirms,” Guardian, July 19, 2011. (78.) Debray, The Chilean Revolution, 57. (79.) Cited in Lavretski, Salvador Allende, 122. (80.) Clark, Salvador Allende: Revolutionary Democrat, 6. (81.) Mario Amorós, Allende: La biografia; and Victor Figueroa Clark, Salvador Allende: Revolutionary Democrat. (82.) Patricio Guzmán, director, Salvador Allende (New York: Icarus Films, 2004). (83.) Eduardo Labarca, Biografía sentimental; and Labarca, Allende en persona; Osvaldo Puccio, Un cuarto de siglo con Allende; Carlos Jorquera, El Chicho Allende; Jorge Timossi, Grandes Alamedas. El combate del Presidente Allende (Havana: Editorial de Ciencias Sociales, 1974); and Óscar Waiss, Chile vivo: Memórias de un socialista, 1928–1970. (84.) Gonzalo Vial Correa, Salvador Allende: El fracaso de una ilusión (Santiago, Chile: Universidad Finis Terrae y Centro de Estudios Bicentenario, 2005). (85.) Paul Sigmund, The Overthrow of Allende and the Politics of Chile, 1964–1976 (Pittsburgh: University of Pittsburgh Press, 1977); Mark Falcoff, Modern Chile, 1970–1989: A Critical History (New Brunswick: Transaction Publishers, 1989); Vial Correa, Salvador Allende; Arturo Fontaine Aldunate, Todos querían la revolución. Chile, 1964–1973 (Santiago, Chile: Zig Zag, 1999); and Nathaniel Davis, The Last Two Years. (86.) Among others, Pedro Naranjo, et al, eds., Miguel Enríquez y el proyecto revolucionario en Chile: Discursos y documentos del Movimiento de Izquierda Revolucionaria (Santiago, Chile: LOM, Centro de Estudios Miguel Enríquez, 2004); Carlos Altamirano, Dialéctica de una derrota (Mexico: Siglo XXI, 1978); Ruy Mauro Marini, Dos estratégias en el proceso chileno (Caracas: Fondo Editorial Salvador de la Plaza, 1974); Gabriel Smirnow, The Revolution Disarmed. Chile 1970–1973 (New York: Monthly Review Press, 1979); and James Petras and Fernando Ignacio Leiva, Democracy and Poverty in Chile: The Limits to Electoral Politics (Boulder, CO: Westview, 1994). (87.) Regis Debray, The Chilean Revolution; Jorge Arrate, Salvador Allende, ¿Sueño o proyecto? (Santiago, Chile: LOM, 2008); Luís Corvalán, El gobierno de Salvador Allende (Santiago, Chile: LOM, 2003); José G. Martínez Fernández, Allende: Su vida, su pensamiento político (Santiago, Chile: Ediciones Palabra Escrita, 1988); Joan E. Garcés, El estado y los problemas tácticos; Ian Roxborough, Phil O’Brien and Jackie Roddick, Chile: The State and Revolution (New York: Holmes & Meier, 1977); Sergio Bitar, Chile: Experiment in Democracy (Philadelphia: Institute for the Study of Human Issues, 1986), James D. Cockroft, ed., Salvador Allende Reader: Chile’s Voice of Democracy, trans. Moisés Espinoza and Nancy Nuñes (New York: Ocean Press, 2000), and Salvador Allende Gossens, Su pensamiento político (Santiago, Chile: Granica, 1973). (88.) Among others: Peter Winn, Weavers of Revolution; Power, Right-Wing Women; Rosemblatt, Gendered Compromises; Thomas Klubock, Contested Communities: Class, Gender, and Politics in Chile’s El Teniente Copper Mine, 1904–1951 (Durham, NC: Duke University Press, 1998); Gywnn Thomas, Contesting Legitimacy in Chile: Familial Ideals, Citizenship and Political Struggle, 1970–1990 (University Park: Pennsylvania State University Press, 2011); Heidi Tinsman, Partners in Conflict: The Politics of Gender, Sexuality, and Labor on the Chilean Agrarian Reform, 1950–1973 (Durham, NC: Duke University Press, 2002); and Mario Garcés, Tomando su sitio: El movimiento de pobladores de Santiago, 1957–1970 (Santiago, Chile: LOM, 2002). (89.) Among others: U.S. Congress, Senate, Select Committee to Study Government Operations with Respect to Intelligence Activities, Covert Action in Chile, 1963–1973; and Alleged Assassination Plots Involving Foreign Leaders (Washington, DC: Government Printing Office, 1975); U.S. Senate, Subcommittee on Multinational Corporations, The International Telephone and Telegraph Company and Chile (Washington, DC: Government Printing Office, 1973); Peter Kornbluh, The Pinochet Files; Seymour Hersh, The Price of Power: Kissinger in the Nixon White House (New York: Summit, 1983); Lubna Z. Qureshi, Nixon, Kissinger, and Allende: U.S. Involvement in the 1973 Coup in Chile (Lanham, MD: Lexington Books, 2009); Jonathan Haslam, The Nixon Administration and the Death of Allende’s Chile: A Case of Assisted Suicide (London: Verso, 2005); and Oscar Guardiola-Rivera, Story of a Death Foretold: The Coup against Salvador Allende, 11 September 1973 (London: Bloomsbury, 2013). (90.) See, in particular, Sigmund, The Overthrow of Allende; Falcoff, Modern Chile; Davis, The Last Two Years; William D. Rogers and Kenneth Maxwell, “Fleeing the Chilean Coup: The Debate Over U.S. Complicity,” Foreign Affairs 83.1 (January/February 2004), 160–165; Jack Devine, “What Really Happened in Chile: The CIA, the Coup Against Chile, and the Rise of Pinochet,” Foreign Affairs 93.4 (July–August 2014), 26–35; as well as Henry Kissinger, White House Years (Boston: Little, Brown, 1979); and Kissinger, Years of Upheaval (Boston: Little, Brown, 1982). (91.) Allende’s Chile & the Inter-American Cold War. (92.) See, for example, James D. Cockcroft, ed., Salvador Allende Reader; and Elizabeth Quay Hutchison, Thomas Miller Klubock, Nara B. Milanich, and Peter Winn, eds., The Chile Reader: History, Culture, Politics (Durham, NC: Duke University Press, 2013).